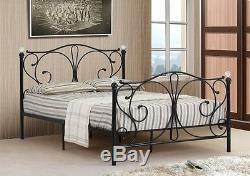 4ft, 4ft6 Double & 5ft King Black or White Metal Bed Frame With Crystal Finials. 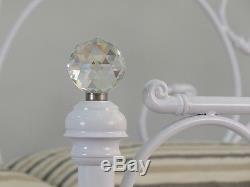 Metal Bed Frame with Crystal Finials. Available in Black or White. Available in 4ft Small Double, 4ft6 Double, 5ft King Size. This beautifully designed bed frame is the latest in modern designer bed frames. Offering a stunning patterned design on both the foot and head end the bed can add style and sophistication to any bedroom. Available in either a black or white finish the bed also has a scroll feature to the head and foot ends giving an extra sculpted look to an already striking looking bed frame and is finished off with crystal finials to each end. The frame features a sprung slatted base with a middle support leg giving extra comfort and support to the designer frame. With the beautiful crystal decorative top pieces this adds a finishing touch to this elegant frame. Available in white or black and available in 3 sizes 4ft small double, 4ft6 double and 5ft King Size. This bed comes flat packed for simple home assembly, all tools and instructions included. Please be advised that mattresses may be delivered rolled. This will not affect the quality of the product. To ensure your new furniture is suitable for your home, please remember to measure your available space before ordering. Also we will only deliver to the front door of the building; our couriers are not insured to carry goods in or upstairs. Available in 4ft small double, 4ft6 double or 5ft king size. Available in either black or white finish. Please note ALL mattress sizes and depths are approx. (within 5cm) and covers may vary. Head board height from floor, 109cm. Foot board height from floor, 87cm. Underbed clearance from floor to bottom of rail, 28cm. Clearance width of bed 130cm. Clearance length of bed 200cm. Clearance width of bed 142cm. Clearance width of bed 160cm. Clearance length of bed 210cm. PLEASE BE ADVISED THAT ALL DIMENSIONS ARE APPROXIMATE, PLEASE ALLOW ROOM FOR SLIGHT VARIATIONS. 13.5 gauge open coil spring system. Medium soft feel spring system. Basic Budget Lucy Mattress Specification. 13.5 Gauge Open Coil Spring System. Luxury Feel Damask Micro Quilted Cover. Mattress Depth 17 cm (Extra Comfort Fillings). Sleep Both Sides - &###xA0;Turn When Required. Dust mite resistant and hypo-allergenic, perfect for allergy sufferers. Mattress depth 25 cm approx. Fully compliant with all UK fire regulations. Memory foam woven into cover. Luxury Belgian damask quilted border. 1000 count pocket spring system. Perfectly suited when there is a weight or size variation between you and your partner. Hand tufted by skilled craftsmen. Luxury knitted Cool touch&###xAE; fabric top. 12.5g Orthopaedic spring system. Over the past few years we have been developing our range of products to enable us to supply consumers with furniture at the absolutely lowest prices possible. We do not have the large overheads that shops and large retail chains have so we can keep our prices low and pass all the savings onto our customers. Cloud Nine Furniture prides itself on its excellent prices and customer service. We invite you to look at our products and pricing and compare them with any other website or shop. Please note the courier drivers are not insured to carry items upstairs/into a property. We are unable to compensate for delayed deliveries. We can only accept products for return with their original packaging in the condition they were delivered. This does not apply to products which are faulty - these will be collected/replaced free of charge. The more info you supply us with the quicker we will be able to rectify the issue. As with nearly all mattress retailers we are unable to accept "used" mattresses for return for health and hygiene reasons. By "used" we mean mattresses that have been removed from their original packaging. Flat packed furniture As with nearly all furniture retailers we are unable to accept flat packed furniture that has been erected or semi-erected. Please Note: Unwanted orders will be collected subject to a &###xC3;&###x201A;&###xC2;&###xA3;15-&###xC3;&###x201A;&###xC2;&###xA3;30 charge depending on your order (to cover the carrier's charges), this does not apply to products which are faulty - these will be collected/replaced free of charge. We will then be able to assist you in either sending replacement parts or a new product. This listing is currently undergoing maintenance, we apologise for any inconvenience caused. (With the exception of Scotland deliveries which will be delivered on Thursday 3rd January) Items ordered between 12pm Monday 31st January & 12pm on Wednesday 2nd January will be delivered on Thursday 3rd January. The item "4ft, 4ft6 Double & 5ft King Black or White Metal Bed Frame With Crystal Finials" is in sale since Thursday, August 28, 2014. This item is in the category "Home, Furniture & DIY\Furniture\Beds & Mattresses\Bed Frames & Divan Bases". The seller is "cloud_nine_furniture" and is located in Bridgwater. This item can be shipped to United Kingdom.